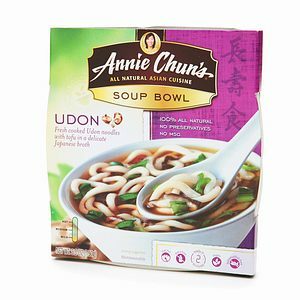 Soups Make for Quick and Delicious Meals | Breezy Mama Breezy Mama - Expert parenting advice, celebrity interviews, product reviews for kids, moms and babies and more! Quick and Easy Meal: Soups! The soup. . . such an easy, tummy warming meal, loaded with nutrients, but always forgotten about (at least in my case). And when I do think of heating up some soup for the kids, I’m always amazed at 1) how easy it is 2) that it’s filled with veggies and 3) that they slurp up every last drop. So I thought I’d take this thought, and move past the Campbell’s and the Progresso’s and see what other options were out there. You won’t be disappointed, I certainly wasn’t. Have that can opener ready! My husband and I love tomato soup–Campbell’s Condensed Tomato Soup is a constant in our kitchen cupboards. Paired with a nice grilled cheese sandwich–heaven! But I digress–I eagerly opened this can to compare to our classic, and MAN, was I not disappointed. I was instantly taken away to a far off cafe, with hot warm bread, and a rich, hearty, and so very yummy soup. I ate the entire can, in one sitting, by myself. 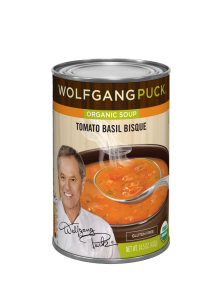 From their site, “A wonderful rich blend of Roma tomatoes, chopped basil, finished with a touch of butter.” Wolfgang Puck Organic Tomato Basil Bisque, $2.50, available at mass grocers. Click here for more info. My husband is a clam chowder connoisseur–the man could live on the stuff. So when I saw this soup in the Vermont Country Store catalog, I thought it would make a good Christmas gift. Instant success–he loves it so much that it has become an annual Christmas tradition. Thick, creamy and filled with whole clams, the stuff is to die for. 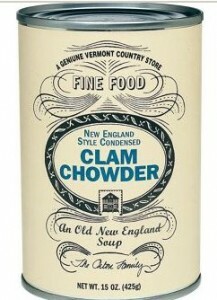 From their site, “They use only the finest and freshest ingredients—and plenty of them—for a hearty, homemade flavor that will satisfy the most discriminating palates.” New England Clam Chowder (Set of 3 Cans), $14.90. Available through the Vermont Country Store, click here for more info and to purchase. We discovered these bowls of goodness at Costco. The shrimp is gigantic, and you get a good amount in every serving. 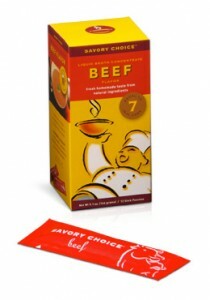 The soup base is a delicate broth that both adults and children will love. There are two versions of this soup–with and without noodles–each one is fantastic. To make, you add water and heat in the microwave–couldn’t be easier. From their site, “Bite into five succulent shrimp wontons made with fresh whole shrimp, complemented with tasty noodles and soup.Made from nutritious shrimps used are raised at eco-friendly farms practicing green shrimp technology, the product contains no preservatives.“ CP Shrimp Wonton, $2.99 per bowl. Click here for Where to Buy. Click here for more info.